Lebanese sources are now confirming that six Iranian Revolutionary Guards and five Hezbullah members were killed in an IAF air strike on Sunday. The Hezbullah members included Jihad Mughniyah, the son of Imad Mughniyah, and the Iranian Revolutionary Guards included Iranian commander Abu Ali al-Tabtabani, the commander of operations in the Golan. Jihad Moughniyah was killed with four other members of Hezbollah when his convoy was hit, the sources said. His father, who was on the United States’ most wanted list for attacks on Israeli and Western targets, was assassinated in Damascus in 2008. Hezbollah issued a statement in which it admitted that 5 of its members were killed including commander Mohammad Issa from ArabSalim. 6 members of the Iranian Revolutionary guards were also reportedly killed in the strike according to Lebanese media reports. “The Israeli enemy’s helicopters fired missiles at a group of Hezbollah’s fighters who were inspecting the town of Mazraat al-Amal in the Syrian Quneitra region,” Hizbullah’s media department announced in the statement. The strike “resulted in the martyrdom of a number of jihadist brothers, whose names will be announced later, after informing their honorable families,” the Hezbollah statement added. 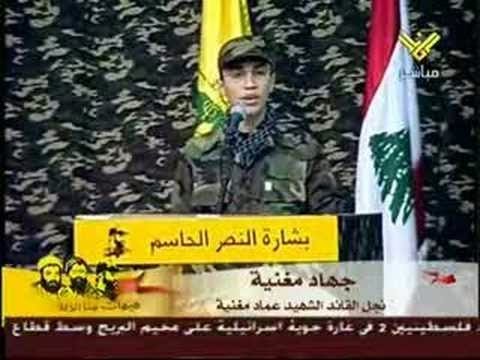 The original Hezbullah announcement in Arabic may be found here. The Hezbullah death toll has been raised to nine. Hezbullah chieftain Hassan Nasrallah is scheduled to give a speech later tonight in which he will announce that Hezbullah will retaliate against Israel. 1 hour ago Information obtained by MTV: Nasrallah will tonight deliver a speech in which he will announce that Hizbullah will retaliate against Israel with a painful strike. Bring it on, you fat pig. We're ready for you. Could Obama do better on Iran?